CONTROLRadioUK #IfWeLikeIt #WePlayIt: Killing Eve Episode 1x06 Take Me To The Hole Review: "Russian Discoveries"
Killing Eve Episode 1x06 Take Me To The Hole Review: "Russian Discoveries"
As we edge closer and closer to the season finale in just 2 weeks time now, and following the events of last week, it is only right that the show shift focus from the cat and mouse game between Villanelle and Eve and dip into Villanelle's origin story. How did she become such a ruthless killer? Where exactly did she come from? Who exactly trained her? Who is the organization leading the charge? What exactly are their goals? Take Me To The Hole may not have answered all of these questions, but we most definitely got to see a different side to Villanelle and found out some rather intriguing information about Carolyn in the process. First things first is that Villanelle had to go back to Russia. Or to be more precise, had to be secretly smuggled into the prison from whence she came, with the sole objective of finding Nadia, and stopping her from telling anyone what really happened out in the Country. This was obviously never going to be smooth sailing. It just would've far too neat and tidy for this to all go off without a hitch. 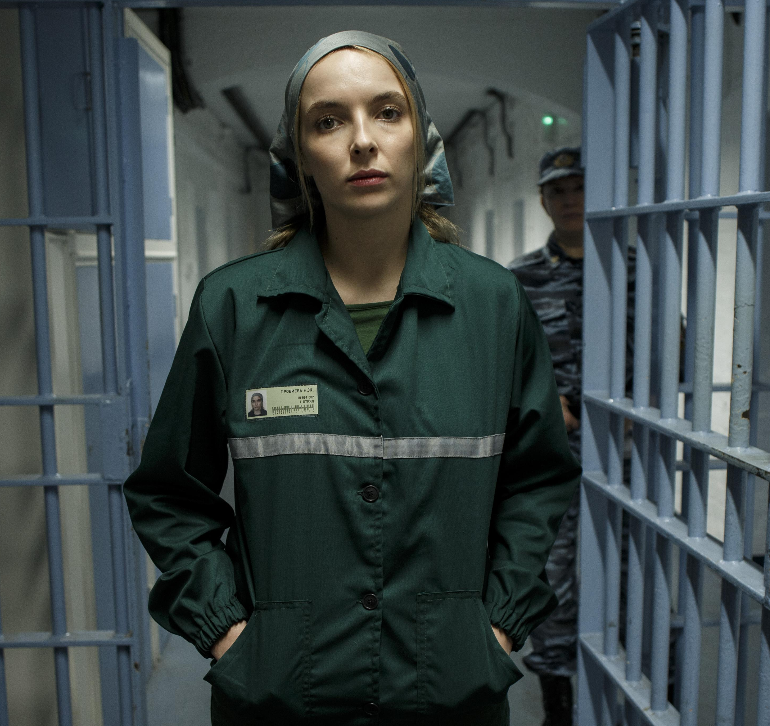 But being back in the prison, we saw genuine vulnerability in Villanelle for the first time. She hated being back among those familiar walls. Surrounded by people who didn't give a damn about her, or her wit. Away from all of her luxuries. It was torturous for her. She was made to clean toilets just like everyone else, searched and basically brutalized in the same type of way she brutalizes people for fun. She did make a somewhat interesting friend along the way, who to an extent shared her love for violence, and was of course able to find Nadia and eventually kill her. In the build up to that we were treated to a rather humorous kitchen scene as Nadia tried her best to run away from Villanelle, whilst of course limping on a crutch, Villanelle caused chaos and distraction which her new friend partially took responsibility for, before Villanelle took great joy in taking out the guards. The job may have been completed but that wasn't the end of it for Villanelle. The lovely Doctor to whom there was supposed to be an agreement with to get her back out once the job was done, unfortunately for her decided he didn't want to play along. So Villanelle instead ended the episode alone, confused, angry, and locked up in her prison cell, seemingly not taking a nice comforting champagne bath anytime soon. Most of the answers to our questions regarding Villanelle came from Carolyn and Eve's interactions with Nadia. They were of course somewhat able to get to Nadia before Villanelle could get to her. Nadia confirms she and Oxana aka Villanelle were once involved and that she was the one who was meant to be taken, but Oxana did something to stop that from happening. And of course just as she's ready to point them in the direction of Konstantin, he walks into the room. So Instead Nadia tells them about Anna. Being the smart cookie that she is, Eve's suspicions are aroused. She very much noticed how silent and scared Nadia looks as soon as Konstantin enters the room and doesn't trust him one bit. She's of course right not to trust him since he is Villanelle's handle, but that's something Eve doesn't know at this stage and Carolyn possibly isn't completely aware of? She, Konstantin and Vlad go way back. She was previously involved with both of them, and when Konstantin gave her some particularly sensitive information way back when, Carolyn claimed Vlad was the one responsible for. It's something he's never quite forgiven her for, and by the end of the episode, Eve has gone rogue and used Carolyn's drunk confession to bargain with Vlad behind her back. She wants more information on Konstantin and Nadia, believing that is the key to discovering just who exactly Villanelle works for and put an end to all of the murders. With Nico and Eve at each other's throats as her investigation into Villanelle continues to swallow her hole, Carolyn made a drunken revelation about their marriage, proclaiming Eve doesn't actually like her husband. Eve is flabbergasted by this and Carolyn muses that she can still love him, but for her, it's always the flings she likes the least that she loves the most, because that love is what made her dislike them so much. She may be drunk, she may have offended Eve, but she is most definitely telling some home truths. I won't repeat myself too much from things I've already said, but it has been obvious since the show started that Eve doesn't quite like Nico as much as he likes her. There are very obvious issues in their marriage, and issues that Eve doesn't seem that keen to fix. Their fight at the beginning of the episode had been a long time coming, as Nico's frustrations boiled over and Eve slapped him which I don't entirely agree with. Sure it was in the moment and a couple shouting at each other so much they become violent, but if it had been Nico slapping Eve, there would be uproar. Entertainment in general doesn't really take violence against men seriously, and I do think that's a bit of a problem. During her conversation with Vlad, she even admits that Villanelle is keeping her up all night. Villanelle and Eve being as equally as obsessed with each other is again not new ground, it's something that's been analyzed by many including myself since the beginning. And of course where there is analyzing, there continues to be people who ship them romantically. Again I'm not going to say whether that is right or wrong, but I do think the writers are deliberately blurring the lines and you know what? It completely works. Jodie Comer and Sandra Oh haven't shared many scenes together over the show's run so far, but these are two actresses who are so incredible with what they do that the chemistry between Villanelle and Eve resonates even when they're not physically together. It's such a twisted game of cat and mouse, both trying to outsmart the other, feelings getting blurred, professional lines in tattered, both basically refusing to give up on one another even when they know they should. When Eve started to talk about Oxana as a way of getting Nadia to open up, Carolyn looked at her somewhat dubious. It wasn't something she was expecting Eve to bring up, but she's desperate for the smallest crumb of information on her. Where the final two episodes go from here shall be extremely interesting. There's no way that Eve going behind Carolyn's back isn't going to backfire on her. There's also the question of just how exactly Villanelle will get out of the prison since she has been seemingly abandoned, and of course who exactly the 12 are, and what the ultimate end goal is here. You can look forward to the next episode of Killing Eve next Sunday at 8pm on BBC America.